If you are looking for an affordable case of great dove shot, then this ammo is for you! 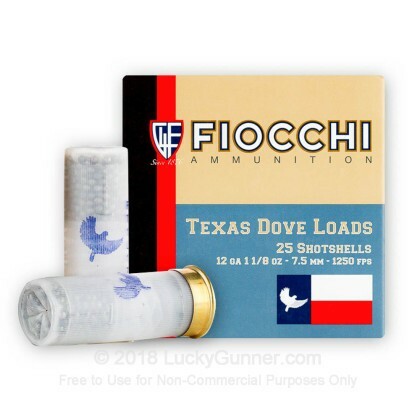 Fiocchi's Texas Dove Load shotgun shells provide reliable hunting ammunition. This 12 gauge ammo has 1-1/8 ounces of #7.5 shot in a 2 3/4 inch shell. Each shell will provide consistent spread, but will be even better with an improved choke. This ammunition does contain lead shot, so make sure that lead ammunition is allowed were you plan on hunting. 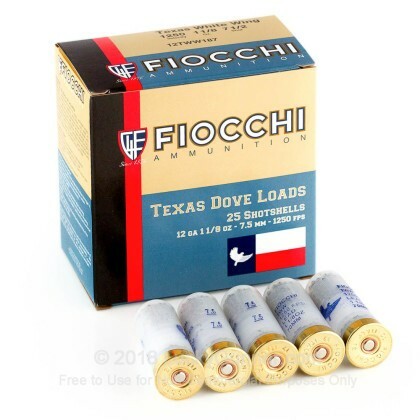 Fiocchi produces large quantities of affordable and reliable ammunition. 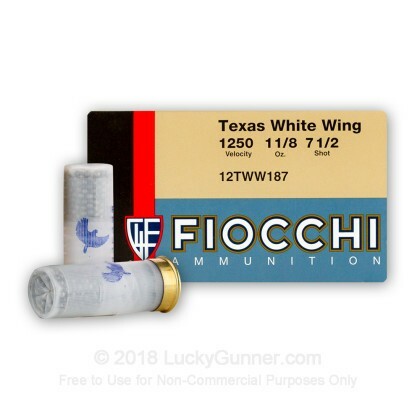 Fiocchi has been around since 1876, and during that time they have produced ammunition for government agencies and private gun owners alike. Fiocchi is an Italian based company. BOOM!!!!!!! They work Great. Glad I've got 500 rd. to play with in Texas!!!!! Great shell for the money & the great name "Texas White Dove" label. I wish that.. they had put 1/4 instead of 1/8. I guess that they were going speed. I wish that I had the cash for the last box to go with my 500 rds.!!! Then it would be 525. I know that I can limit out fast. Try this load, and you will not be disappointed, even if you don't hunt in Texas, where Labor Day dove hunting is a deeply engrained in their history and culture!! Support this load so it will continue to be made!